The current path is displayed at the top. The first entry in the file list is to go up one level. Callback functions for file selection and directory selection. If you return false from these callback functions, then dialog is closed. Callback handler when OK is clicked. The argument to the callback function is currently selected DirectoryEntry in the dialog box. All above parameters are optional, including file_browser_params object. This dialog box can be used as both File selection or Directory selection dialog box. Thx for making the effort to explain the terminlogy to the novices! This doesn’t work as is. Could you please provide complete example files. I have posted a complete example here. You will see files only when you run this code in PhoneGap application on mobile. I was trying for the last twenty days to get your code work with eclipse, in fact it works on iOS, but not in android, although i set all the permissions I just can’t find where is the problem! Can you please give me the whole android project so I can see where is the problem? 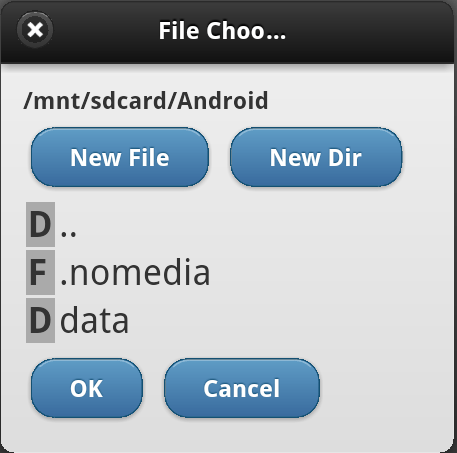 we are integrate file chooser app in my phonegap (cordova version 2.9.0) application it displays the file directory ,but file select option is not working it shows file_Browser_params.on_file_select is undefined. please give me the reply as soon as possible. Thanks a lot it works great! Maybe I’ve missed up the project configuration. Use FileTransfer from phonegap API. Its not listing the folders and files in IOS , working only on android ,how to findout ?? Each application in iOS has access to its own private folder only, unlike in Android where applications have access to the entire file system. So you won’t see any file/folder in iOS using the sample code I postes, unless your application creates ones. Great Tutorial, but can you please give a code sample of how i can select a file and upload it. My phonegap experience is not really good. I don’t have a sample code ready for uploading file (I am assuming you want to upload to a server). Once you select a file using file chooser dialog, read the file content using PhoneGap file APIs and then send it to a server using XHR. JQuery has utility functions to post data to server. Great Tutorial, I have just tested for android and its working fine. When I am trying to install on my Galaxy S Adavance 4.1.2 Jelly Bean. I am not able to view the directory structure. An alert is displaying with “[Object object]” message. I have uploaded new FileChooser project created with PhoneGap 3.3. I have tested it on Android 4.2.2 and it worked fine. Nice tutorial. I searched last one week for this one. In this i got file path how to get the file type and its contents. Thank you. When i read the type like fileEntry.type it shows undefined. Hi Ram…sorry to disturb. It works well but some times the file chooser shows empty(files are available in my device).Any idea. Check JS console for any errors. Also you may want to set file_Browser_params.initial_folder = null before showing the file chooser dialog. var file_Browser_params.initial_folder = null ; Because it is already present in init function. Again to sorry to disturb is that any limitation for picking files. When i pick more than 5MB application closed unexectedly. Thanks for your reply. I am able read all type of files. lot of persons having this issue now. Some of them posted in forums today. Now working on this one. After pick file the file read as toDataURL. I think it creates issue if it exceeds some limit. How to pick multiple files at the same time. I haven’t implemented multiple file selection. But it is not too difficult. I guess you can modify the source code to support this. yes done it…Thank you so much.. I tried your android project and it didn’t work. I’m looking to find a workaround for the webview bug that causes the input file type to not work at all. (It’s related to the openfilechooser api which they removed) The newer android project shown (3.3) seems empty. Could you help me with this problem? Click Browse button next to Root Directory text box and select FileChooser/platforms/android and click Open button. You should see two projects (FileChooser and FileChooser-CordovaLib) listed and selected. Click Finish. Run the application on a device or emulator. I have tested this on Android 4.2.2 and it works fine. I’m using the adobe phonegap build service and it didn’t work there. I am testing on a Google Nexus 5 32 GB with Android 4.4.2 kitkat. It works when I run through adt and copy the apk. Any advice on how to include in build service? very nice artical but can you tell me how to read/write files from external SD card if its available. Thanks for such a good article and also working fine in android and ios, but in ios it will shows only NoCloud directory, how to change a root directory to applicationStorageDirectory path ?